Robert J. Blakely began his career at an early age. From high School he was always the guy in the shop tweaking engines. After high school he entered Loyalist College to begin his training and schooling to be a Class A Mechanic. He started his training at Action Auto in Kingston Ontario and finished his 5 year apprenticeship and bid goodbye to working on cars only to go onto bigger and better things. 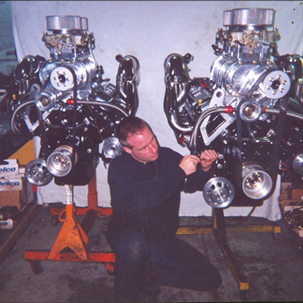 Starting out of his families garage Robert began his future career as a marine engine builder and designer, only to realize his immense skills, he soon opened his own 3,000sqft full machine shop and engine building business. As of today Bullet Racing Engines has now powered over 740 boats ranging from V-Hulls to Cats with horsepower from 300HP to an incredible 1200HP. Robert has earned himself a reputation for not only being an honest businessman, but also as a top notch marine engine designer and builder. Bullet Racing Engines is a full machine shop with one of North America's best machinists, Steve Baksi, with 16 years of machining experience under his belt. Bullet Racing Engines is one of a few shops where all you need to do is drop the boat off and pick it back up again with no worries or hassles. Full rigging, custom paint jobs and the promise of perfection are what you can expect from Bullet Racing Engines. Bullet Racing Engines makes the purchase of a high performance engine easy thanks to their unbeatable pricing and thanks to the U.S. currency rate over 70% of Bullet's customers hail from the United States with no hassle shipping they make it easy to be number #1 on race day. Remember: Why own a slug, when you can own a Bullet? Give us a call at 613-634-3618 so we can get you to the head of the pack.